This large 3 bedroom family friendly apartment is within the private coastal complex Buenas Noches. 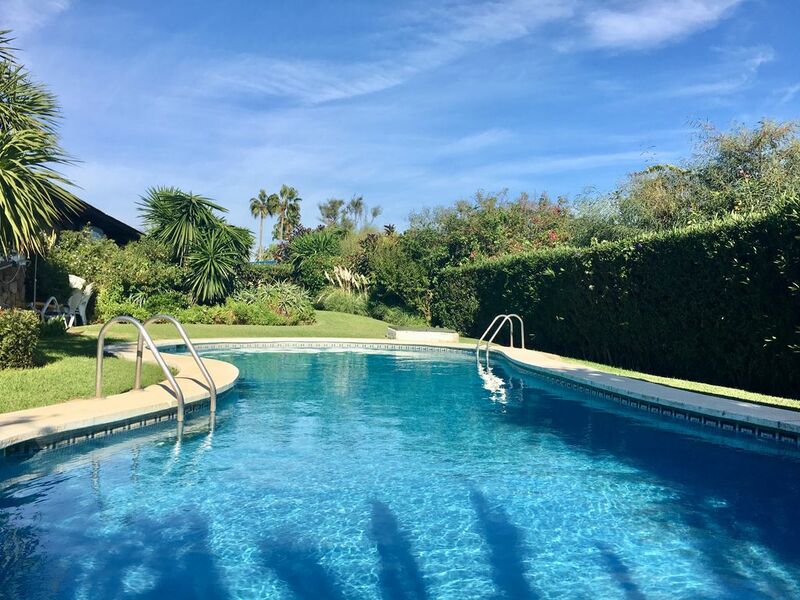 Las Bouganvillas is in a great location right on the coast, opposite the beach and close to golf courses – ideal for a peaceful family holiday and golfers. You will be able to enjoy a shared pool that is set within lush private shared gardens. Airconditioning, WiFi, contemporary neutral décor, modern kitchen with granite worksurfaces, marble floors, south-facing sunny terrace overlooking the pool, lush shared garden, sea views. Heating, docking station, kindle charger, iPhone charger and quality stereo, linen, high chair and childs stair gate, car parking are all available for you to enjoy. There is a beach opposite - accessed via a footbridge. This apartment is within walking distance to Casares Del Mar beach, Finca Cortesin beach Club, La Perla and La Sal beach bars. There are supermarkets within walking distance. Playa El Cristo beach, Playa de la Rada Beach, Costa Natura beach, Sabinillas beach are within seven minute drive along the coastal road. From the large terrace, you’ll have breath-taking panoramic undisturbed sea views of the Mediterranean Sea, Gibraltar, the Atlas Mountains Africa, pool and gardens. A wellness spa, tennis, pitch and put golf and exercise facilities are less than five minute drive at Albayt Country Club and day spa. Estepona marina and old town are less than a ten minute drive from this apartment. Beach bars and restaurants Finca Cortesin and La Sal Beach Bar are within walking distance along the beach opposite. Night time entertainment is closeby at Estepona Marina, Estepona Old Town, and Puerto La Duquesa. Marbella, Puerto Banus and Tarifa are all within easy driving distance. Local buses available close by. Golfers will be perfectly located. Finca Cortesin Golf Club, La Cala, Valle Romano, El Paraiso, Atalaya Country Club and Golf, Los Arqueros Country Club, Estepona Golf, Paradise Golf, Casares Costa Golf, Villa Padierna, Marbella Club Resort, Los Naranjos - are just a few local golf courses. Assistance with car hire, airport transfers, arrival packs/shopping, extra cleaning and linen all available upon request. Discounted longer-term winter bookings are also available upon request. Pets welcome subject to extra cleaning fees shown. I purchased my lovely apartment over 24 years ago. I use it as much as I possibly can with my family when I'm not busy working in London. I travel a lot and enjoy holidays which range from 2 - 5 stars, so I understand good value for money and what represents good accommodation. For me owning a 2nd home abroad was all about the sea and beach and this apartment has it all. It's large, it's opposite the beach, it has the most amazing sea views and I can see the mountains too. It's on a very secure and private residential complex so whether I am there on my own or with my family I always feel safe. The apartment is within close proximity to the town centre. Just a 7 minute drive along the beautiful coastal road with mountains in the backdrop and I am in either Estepona Port East or Sabinillas West, close enough to get into town with ease but away from the hustle and bustle, perfect! I can walk to a supermarket, a 5 star beach club/bar, a 2 star beach restaurant, a day spa and gym and I have a shared pool. Car hire is essential when staying at my apartment but there is a bus stop outside and buses run frequently so all in all it works for me and my guests. Location, location, location ... sea views, mountain views, proximity to beach, private exclusive complex of 1 low rise block surrounded by individual villas all with own pools. Turn off the coastal road straight into Buenas Noches and our car park is at the entrance so it's really really easy to find. This apartment is simply huge. The apartment has one full bathroom and one half bathroom. The main bathroom has a bath with shower over, toilet, sink and vanity. The second bathroom has a toilet, sink and vanity only. This apartment is surrounded by beaches. Playa Del La Planta is opposite the apartment - quiet local beach accessed via footbridge. Playa Ancha Casares is within walking distance. Estepona old town is a short drive along the coast. 2nd line to the beach, on the opposite side of the road from the sea. This apartment has beautiful views of the sea and mountains. This apartment has beautiful views of the moutains in Estepona. On a clear day it's also possible to see the Atlas Mountains and Gibraltar from the South facing terrace. This apartment has stunning panoramic views of the sea. The apartment has views of the pool as well as beautiful sea views. Apartment made up with one set of linen. Extra set of linen provided for guests to change for stay of eight nights and over. Clothes horse provided to dry clothes. Private parking space for 1 vehicle and space for additional cars outside of private car park very close by. Two towels provided for each guest. Excluding beach towels. Large open plan living/dining room dining room, with doors to large terrace. Sea and mountain views throughout. Open plan dining area with high chair and 6 chairs. Views to sea and beautiful modern open plan kitchen with granite worktops and LED lighting. Ample place settings for a nice dining experience. Well kept shared garden with safe area for children to play. Lovely large veranda with panoramic sea views. 20meter square terrace with panoramic views of the sea, Estepona/Marbella, Atlas Mountains, Gibraltar, individual villas within Buenas Noches and mountains. Outdoor table and chairs for six on the private terrace. Shared sun loungers and chairs in the garden (shared with other residents). Local gym, spa and tennis courts 5 mins from the apartment. This apartment is surrounded by golf courses. The closest being only a 5 minute drive away. Well kept communal pool shared with other residents often guests will enjoy the pool to themselves. Set in a small but lush private garden sheltered from the road. No lifeguard present. Large duplex style apartment with a stair case leading up to the main living area which is all on one floor. Stair gate available for children. At the foot of the stairs is a large area for storing bags, luggage, golf clubs, prams. Located just off the N340 coastal road and easy to find. The beach is accessed via a foot bridge and the road is screened by trees and lush well kept gardens. Shared swimming pool and gardens are within a residential complex, it's not unusual to have the pool to yourself. The pool is open beginning of May - October and sometimes outside of these months if the weather is nice. The pool doesn't have a life guard therefore all children must be supervised. Very child friendly apartment in a quiet location a short drive into Estepona. Most of the restaurants and bars are a short drive away or 10-15 euros by taxi. Available for long lets of 3 months or over at discounted rates. Extra house keeping and laundry service is available at an extra cost. 2nd time at Las Bougainvillas and once again can't fault it. the variety of beaches and driving into the mountains before heading for our daily walk. I bought a dongle locally for only £10 euros. FIVE STARS. We will be back again soon. This bright, light apartment is perfect for families or - as we were - a group of friends wanting space and sunshine. Estapona is a very pleasant town, with a long sandy beach, and lots of restaurants to choose from. Highly recommended. Spacious, clean & great sea views. I travelled with my Husband and 18 month old and we just loved the space in this apartment. It has a large lounge with beautiful sun terrace which was ideal for bbq's & really good sized bedrooms. The apartment is clean and well equipped with everything you should need, the pool was lovely & peaceful - we were often the only people using it. The Owner was really helpful as has so much knowledge of the area, she helped with car hire & gave us a list of the best local beaches & resturants to visit - this is invaluable information when you are travelling somewhere for the first time with a small child! I wouldn't hesitate to stay here again & would highly recommend others to stay here too. Wanted a nice apartment and was a bit sceptical at first as it is advertised as budget and some of the reviews were not amazing. However I found the apartment amazingly clean, amazingly bright, amazingly well furnished and we simply couldn't believe that the owner advertises it as budget accommodation. The rates are amazing compared to other advertisers, when divided between 4 / 6 people it works out around £10 per night per person and frankly you can't book a beach hut, pension or BnB anywhere in the world for these rates these days. Or if you do, you don't expect shiny marble floors, clean linen and towels, breath taking sea views, a pool, coffee making machine and the ability to pay by credit card. Call me new age but this place rocks in terms of value for money v comfort during your stay. I am going back and passing the word on too. Thank you for taking the time to leave a review. I am delighted you enjoyed your stay and found the apartment clean and good value for money. I guess I am under selling it by advertising it as budget but I've always felt that not over promising and keeping the prices keen are some of the reasons why my regular guests come back time and time again. Hopefully you will too! What a lovely relaxing holiday, great times. My Wife & I stayed here with our friends, 5 of us in all. The apartment was a great size, clean & fresh, with great sea views & didn't feel cramped at all, the facilities were good with fresh towels/linen etc& the kitchen has all you need. The beautiful pool & garden were great for relaxing in the lovely sunshine & although it is a communal pool we never saw anyone else there. Estepona is a lovely area with alot of character, nice little local bars & with Puerto Banus & Marbella just down the road you get the best of both worlds. at least she give us the keys, this appartment was the dirtiest one I ve seen, a porchery, we have been shoked and when we asked the keyholder she doesnt stopped speanking spanish and done nothing for us. We had to buy towels and bedleanen, and four days after a woman brings us towels and sheets. we spend two weeks in the appartment and nobody asks about us or about the appartment cleanness.